On February 7, the Rt Hon. 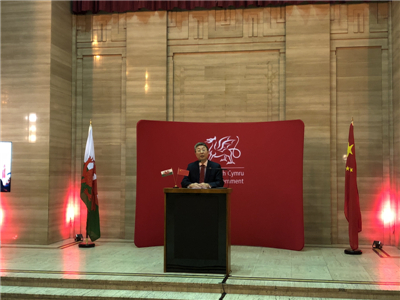 Mark Drakeford AM, First Minister of Wales, hosted the Chinese New Year Reception 2019 at the Temple of Peace in Cardiff. Minister Ma Hui, Eluned Morgan AM, Minister for International Relations and the Welsh Language, and Professor Nora H de Leeuw, Pro Vice-Chancellor of Cardiff University and nearly 200 people from Welsh government, industry and business, education, sports and media sectors as well as representatives of overseas Chinese and Chinese students and institutions were present. Minister Ma noted that, thanks to the support and hard work of both sides, China and Wales have deepened exchanges and cooperation in various fields. There are now nearly 20 Chinese companies in Wales. 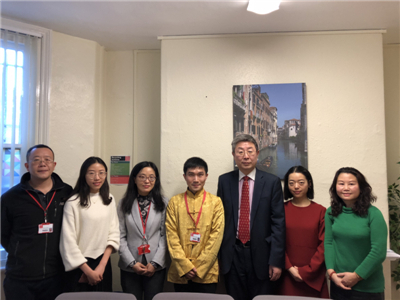 With ever closer educational and cultural cooperation, the two sides have established three Confucius Institutes, and Beijing Normal University and Cardiff University launched a Joint Campus in the UK. The friendly exchanges have been continuously increasing. During Prime Minister May’s visit to China last year, Wuhan of China established sister relationship with Swansea. “In 2019, China will celebrate the 70th anniversary of the founding of the People’s Republic, and the UK will leave the EU according to its plan. China-UK relations will be faced with new opportunities for development”, Minister Ma said. He hoped that Wales would benefit from the potential of China’s deeper reform and further opening up, the growing China-UK relations and the thriving sub-national cooperation in order to promote the cooperation with China and achieve new progress. “For friends, the most precious thing is to know each other’s heart. In the new year, China will continue to be a true friend of Wales who knows your heart”, he said and pledged that China would continue to expand exchanges and dialogue, dovetail the development policies and deepen business cooperation with the UK, so as to achieve win-win results and take the China-UK “Golden Era” a step forward. 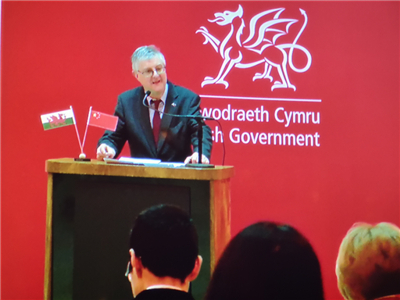 First Minister Drakeford said in his speech that over the past year, Wales has made much progress in its cooperation with China in the fields of education, culture, technology, business, trade, tourism and local-government cooperation. Despite of Brexit, the Welsh government will remain open and warmly welcome companies and investments from all over the world, including China. The Welsh government and people from all sectors will work together to seize the opportunities to promote the cooperation with China in various fields to gain more fruitful results. 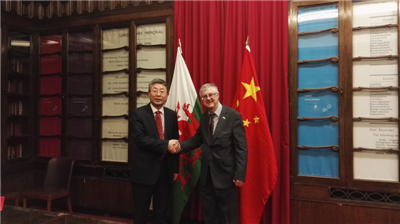 Before the reception, Drakeford met with Minister Ma and they exchanged views on deepening exchanges and cooperation between China and Wales. During the day, Minister Ma met with Professor Nora H de Leeuw and Professor Ruddolf K Alleeman, Pro Vice-Chancellors of the University of Cardiff, visited the Confucius Institute at Cardiff University and Cardiff China Medical Research Collaborative, and met Chinese language teachers and volunteers of the Cardiff Confucius Institute, and Chinese students and research fellows of the Medical Research Collaborative.